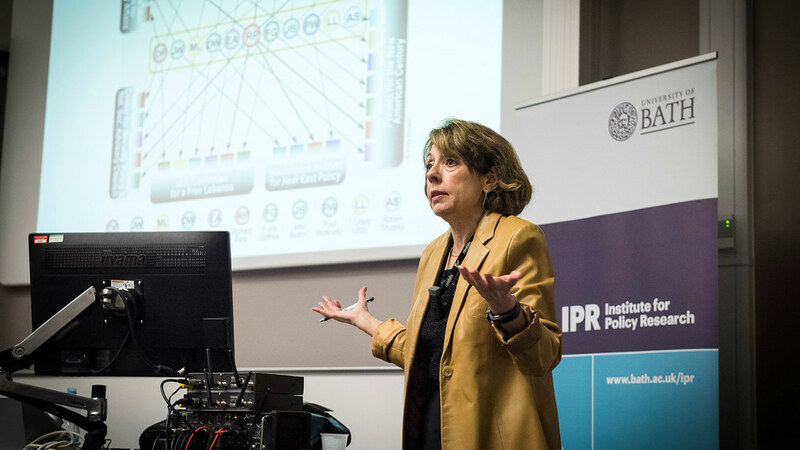 Leading US academic, Professor Janine Wedel, be announced as the new IPR Global Chair for the University of Bath’s Institute for Policy Research (IPR). Leading US academic, award winning author and public intellectual, Professor Janine Wedel, will on 27 April 2016, be announced as the new IPR Global Chair for the University of Bath’s Institute for Policy Research (IPR). University Professor in the School of Policy, Government, and International Affairs at George Mason University and author of ‘Unaccountable: How Elite Power Brokers Corrupt our Finances, Freedom and Security, named in a Bloomberg survey of favourite reads, Wedel’s appointment marks a significant milestone for the IPR which over the past years has expanded its reach and influence both nationally and internationally. As IPR Global Chair Professor Wedel will take part in a series of meetings with academic colleagues, and present an IPR Public Lecture on Thursday 28th April, entitled: ‘Meet the New Influence Elites: How Top Players Sway Policy and Governing in the Twenty-First Century’. She will revisit the University later in the year. Her specific areas of research include anthropology of policy, influence elites, corruption, Eastern Europe, foreign aid, governance and privatisation of policy and social networks. During her time in Bath this week she will meet leading University researchers to discuss areas including healthcare and lobbying challenges. A graduate of the University of California, Professor Wedel was recognised as one of a handful of "Distinguished Alumni" PhDs chosen to speak at the Berkeley anthropology department’s Centennial celebration. She is the co-founder and president of the Association for the Anthropology of Policy (ASAP), part of the American Anthropological Association. ASAP was established to provide an institutional home for anthropologists studying policy issues to engage with their peers. She was also the first anthropologist to win the prestigious Grawemeyer Award for Ideas Improving World Order. She has written 6 books, the most recent ‘Unaccountable: How Elite Power Brokers Corrupt our Finances, Freedom and Security’ in 2014.